The Specials, whose records highlighted rising unemployment and social problems in Britain 30 years ago, have confirmed they have reformed. The Coventry ska outfit, whose hits include Ghost Town and Too Much Too Young, were hugely influential in the late 70s and early 80s. Singer-songwriter Neville Staple said the group had recently been rehearsing. 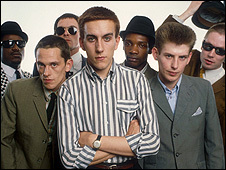 Former lead singer Terry Hall is said to have rejoined the line up, after leaving because of a rift. Speaking to BBC Radio 6 Music earlier this year, he said no tour dates had yet been confirmed. "Well we're still trying to put dates together, but hopefully September or October time. "We need to spend the summer rehearsing... I think it's taken me 30 years to realise we could do it really well." Band members Terry Hall and Lynval Golding made surprise appearances at last year's Glastonbury Festival.